Since Kodak ditched Kodachrome and introduced Ektachrome 64T there has been much debate and discussion about filtering and the best way to go about it for the Tungsten balanced stock. The discussion raises bigger issues for the serious Super 8mm shooter, particularly when using professional stocks many of which need specific filters and many of which are also Tungsten balanced. In a nutshell, the issue is around whether one should use the cameras internal daylight 85 filter to balance Tungsten films for daylight use, or use external filters on the front of the camera. Films notched as Tungsten balanced will leave the internal filter in place when the camera is set in ‘Daylight’ mode (usually denoted by a sun symbol) i.e. it will be between the film and the lens. Films notched as daylight will swing the filter out of the way when the camera is in ‘Daylight’ mode i.e. not in the pathbetween the film and the lens. 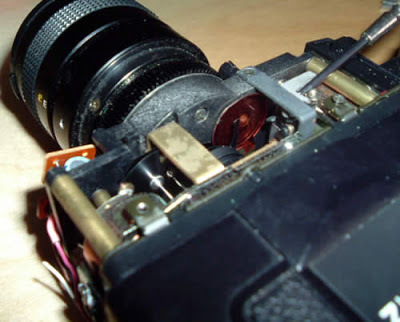 When the camera is set to ‘Indoor’ (usually denoted by a bulb symbol) the filter is moved out of the film path – the same happening when a Daylight balanced cartridge is used. The picture above is (was) a Chinon 30R XL, which had sadly expired long before we sacrificed it on the alter of Super 8mm information. The switch to engage the filter (Daylight/Indoor) activates a swing arm which moves the filter in and out of the path between the lens and the film. 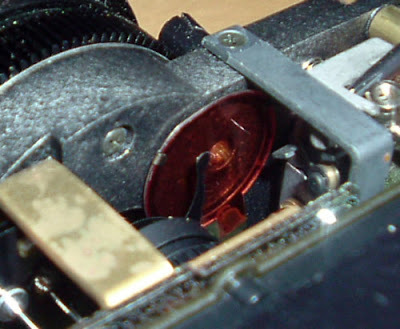 On some cameras the same swing arm also triggers a micro-switch circuit which indicates the presence of the filter or not, for light metering purposes as all stock performs differently under Tungsten lighting and Daylight (Kodak Vision 200T for instance is 200ASA under Tungsten, 125ASA in Daylight). In this case, you’ll notice that the filter itself is a low quality piece of coloured plastic – hardly the best optical element to have between your image and your film. Some cameras have better quality filters (this was a low-end camera) but all will suffer (unless they have been serviced) some deterioration since manufacture either degradation, or dirt and dust. So given that the internal filter is only one filter type, it might not be of the best quality and we might want to be shooting a variety of film types in both daylight and tungsten varieties, what’s to be done? 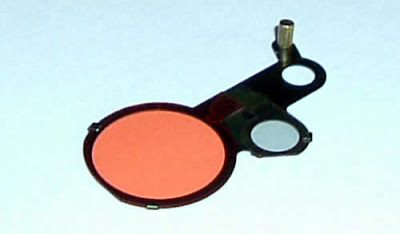 External screw-on filters are widely available and come in a variety of sizes to fit most Super 8mm cameras. Using external filters allows you to choose the warmth (or otherwise) you want to give when using Tungsten stock. 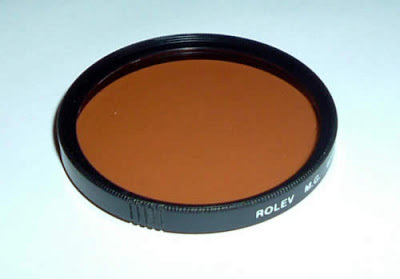 An 85 filter for instance not as ‘warm’ as an 85B filter, but is ideal for use in more overcast conditions. Using good quality screw-on filters will not only improve the light path within the camera by removing the old internal filter, but give you total control of your imagery. ‘Through The Lens’ (TTL) metered cameras will cope with external filters without issue as the light is metered after it has passed through the filter and lens. Non-TTL (generally cheaper) cameras will not be appropriate for this solution – and chances are they won’t be compatible with today’s more exotic film stock anyway. Remember, you’ll need to remove the external filter if you switch to daylight stock, and you might want to change the external filter if lighting conditions change dramatically. For instance some prefer an 85 filter at the beginning and end of the day, with an 85B when daylight is at its brightest. So, for Tungsten Stock – set to Indoors – filter on the front – simple! Whilst for some this might be too much hassle, if you want to make the most of modern film stocks, a little effort will reap dividends.